This week's issue of Physical Review Letters reports new class of measurements on the high-pressure behavior of spin and charge density waves in single crystal metals. 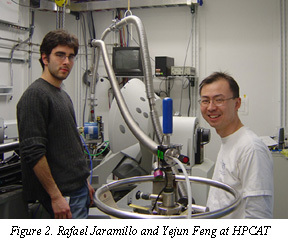 Using high-resolution x-ray microdiffraction techniques at HPCAT, Yejun Feng from the University of Chicago and collaborators from Argonne National Laboratory and University College, London have shown that it is possible to drive the antiferromagnetic ordering temperature TN in elemental chromium to zero with pressure. At the same time, the group has shown both pressure and chemical doping have similar effects on the magnetic order at small dopant concentrations. At ambient pressure and a critical dopant concentration, the ordering temperature falls rapidly to zero. Combining the effects of doping and pressure should therefore allow a "tuning" of the ordering temperature. These experiments were extremely challenging due to the very small signal levels (typically an order of magnitude smaller than Bragg diffraction peaks) and were the first of their kind to be performed. An entirely new technique was developed that would allow analysis of the measurements of spin-density wave (SDW) and charge-density wave (CDW) diffraction peaks as a function of pressure at liquid He temperatures. The HPCAT facility as a whole was designed and built to allow a variety of such demanding experiments. Using a two-band model of a nested SDW gives the ordered moment as a function of pressure. Assuming BCS-type superconductivity, the linear relationship between the energy gap and TN gives the ordering temperature as a function of pressure, as shown in Fig. 1. Doping pure chromium with vanadium also has the effect of reducing TN in a manner analogous to pressure below about 2.5 atomic percent vanadium. As disorder sets in, however, the system is moved away from typical BCS-type behavior and the ordering temperature decreases to zero by 3.4 atomic percent vanadium in the alloy. 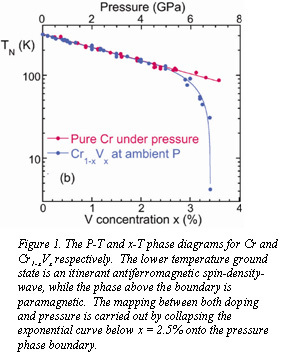 The experiments now open up the possibility of investigating SDW and CDW phenomena in a host of other materials, such as high Tc superconductors and dilute alloys both as a function of temperature and pressure. 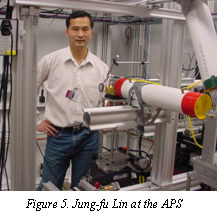 [Feng, et al., Phys. Rev. Lett., 99, 13720 (2007)]. 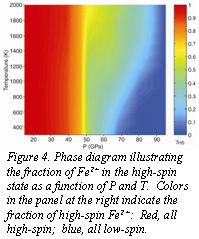 Spin State of Iron in the Earth's Mantle: A Spin-Transition Zone? The investigation of mineral properties at the pressure and temperature conditions of the deep mantle represents a key step in understanding the structure and evolution of the Earth's deep interior. With recent developments in diamond anvil cell techniques, particularly the application on of laser heating at near-megabar pressures, a more accurate picture of the behavior of important mineral phases at relevant conditions is now possible. Former CDAC Research Scientist Jung-Fu Lin, now a Lawrence Fellow at Livermore National Laboratory (LLNL), has recently shown that divalent iron in the ferropericlase structure (Fe,Mg)O gradually undergoes a transition from a high-spin state to a low-spin state from approximately 1000 km depth and 1900 K in temperature to 2200 km and 2300 K. Lin and co-workers from Carnegie, LLNL and the ESRF, working at the GSECARS sector at the APS, used x-ray emission spectroscopy to monitor the spin state of iron in the lower mantle composition Mg0.75Fe0.25O. As shown in Fig. 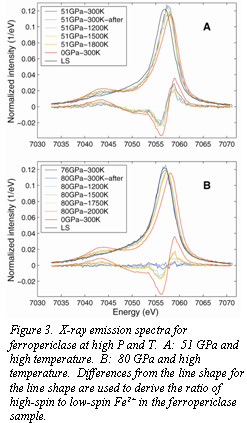 3, the satellite emission peak at 7043 keV, representative of the high-spin state of Fe2+, decreases in intensity with pressure beginning at approximately 50 GPa, where the high- to low-spin transition begins to take place. Between 50 and 95 GPa, elevated temperatures can reverse the formation of low-spin Fe2+, causing the P-T space of the transition to become broader at high P and T (Fig. 4). This effect is minimal above 95 GPa, however, after the transition to a low-spin state is complete. Diffraction measurements taken before, during and after laser heating at various pressures show clearly that the change in spin state takes place completely within the B2 structure, with no evidence of a phase transition. The spin state of iron in the lower mantle as well as the structure of ferropericlase has important implications for a number of lower mantle properties, among them the density, sound velocities, and thermal conductivity, as well as element partitioning. The presence of such a "spin-transition" zone in the lower mantle would appear seismically as a region with a unusually steep density gradient. [Lin, et al., Science, 317, 1740 (2007)].